Well, the court of law in Canada has ruled in favor of Arctic Cat in the patent litigation brought by BRP regarding the chassis of Cat snowmobiles built from the Twin Spar in 2007 through the ProCross and ProClimb in 2015. 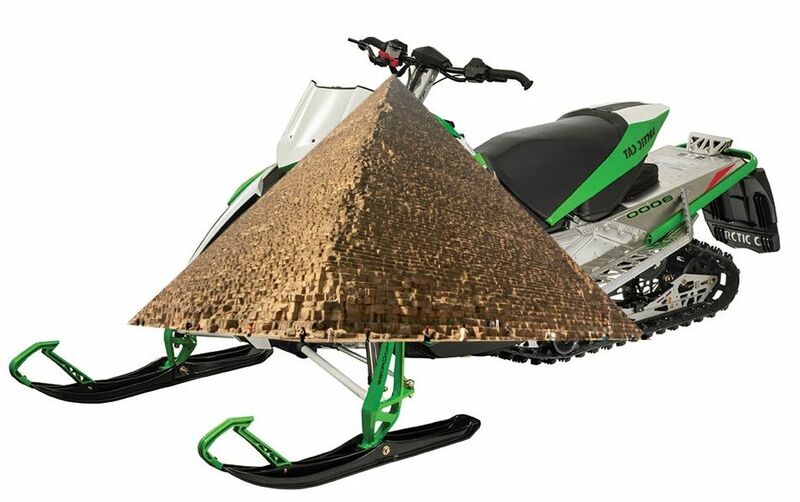 Apparently Ski-Doo did NOT invent the pyramid. Or something like that. Either way, great news for Arctic Cat and justice. And, as was predicted years ago, the real winners were the lawyers with the billable hours. Feb. 27, 2017-- Arctic Cat Inc. (NASDAQ:ACAT) today announced that the Federal Court in Canada has issued its trial judgment in favor of Arctic Cat in the longstanding patent infringement action brought against it by Bombardier Recreational Products Inc. At issue in the case were approximately 44,000 Arctic Cat snowmobiles covering model years 2007 through 2015. BRP had alleged that Arctic Cat's snowmobiles infringed 56 patent claims contained in four Canadian Patents. In its decision, however, the Federal Court found all claims in three of BRP's four asserted patents invalid by reason of the insufficiency of those patents' disclosures and their ambiguity. The remaining patent, directed to snowmobile chassis having certain pyramidal frame elements, was found not infringed. Michael Okerlund, Arctic Cat's vice president of legal affairs, stated: "Arctic Cat has great respect for the legitimate bounds of its competitors' intellectual property rights. That respect certainly extends to all competitors, including BRP. While we appreciate that reasonable minds may sometimes disagree – and obviously the parties disagreed here – Arctic Cat has long believed that its own innovative snowmobiles steered well clear of the legitimate bounds of BRP's patents." The suit was originally filed on December 15, 2011. The patents-in-suit included: Canadian Patents 2,293,106 (the "106 Patent"), 2,485,813 (the "813 patent"), 2,411,964 (the "964 Patent"), and 2,350,264 (the "264 Patent"). Ron Dimock and Angela Furlanetto of DLA Piper (Canada) and Michael Crinson of the Aitken Klee firm (Toronto) represented Arctic Cat in this matter. Great news for Cat! Plus BRPs 850 blows belts and the engine at 1500 miles! Correction...5 plus. That is way more efficient. I had a 15 800RR I liked the sled. I also like ski doo I currently own a 17 850 ski doo, and sorry dulpher it doesn't blow any belts and certainly the engines don't blow up at 1500miles. Being blindly loyal doesn't help anyone. I blew a belt after gorging myself at Chipotle the other day. HotZ: Go get your sled updated at a quality dealer and your belt issue will be fixed. I second that wfo bring back the ZRT!!!! !